The ConcreteCalc Pro is a hand-held Concrete Calculator that lets you solve advanced yard, feet-inch-fraction, ara, volume and weight math problems related to building projects. It's designed for Concrete, Masonry, and Paving Professionals. Rebar solutions for total Linear Feed and Weight per size. Complete Stair Layouts; set Riser Height and Tread Width. 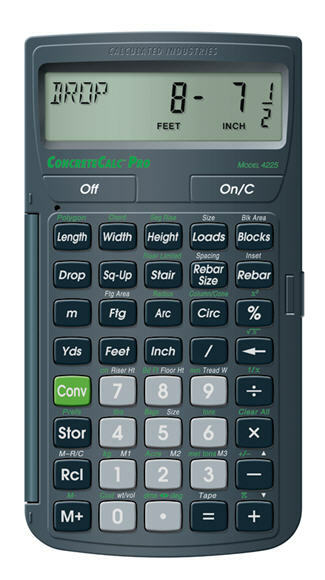 The ConcreteCalc Pro is manufactured by Calculated Industries.